Hammond Model P-40 | MOSweb Online! Equipped with a two channel amplifier, two 15″ speakers and two 12″ speakers serving the bass and treble channels respectively. 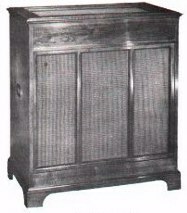 This tone cabinet in conjunction with a Hammond tone cabinet with reverberation can add the additional power required for larger installations at a minimum cost. Can also be used alone where sufficient natural reverberation is evident.